The Rule of Law exists for three purposes: to regulate government power, to provide equality before law, and to provide procedural and formal justice. In the broadest sense: Law supplies the framework for dispute resolution and the ordering of society. For the Rule of Law to achieve these ends, equal access to the courts of justice and equal access to the laws and to the materials that explain the rules of evidence, the rules of procedure, and the relationship of laws to other law is essential. 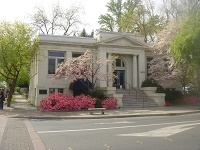 County law libraries, in California, are public libraries, free and open to the judiciary, to state and county officials, to members of the State Bar, and to all residents and non-residents of the State of California, for the examination of books and other printed materials, for access to photocopiers and printers, and for access to online resources. Our mission is to make the Rule of Law equally accessible to all people.